← Why Strength Endurance is Important! In order for an athlete to be competitive at the specific times during the sporting calendar an athlete needs to be organized and take time to plan their calendar for competition and testing. The calendar has to be simple suggestive and be easily modified in order to facilitate changes due to the athletes rate of progress. It must also be realistic and consider the athletes potential in its goals. Negative issues such as crashes, illness, personal issues can all interfere with the calendar hence the need for it to be easily modified. 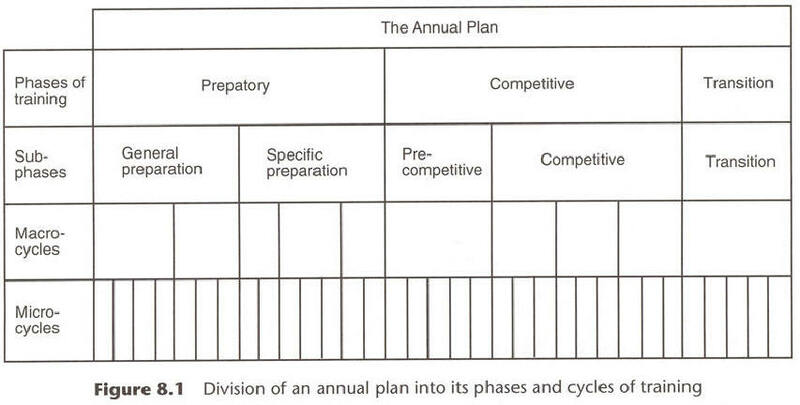 Preparation Phase, Competitive Phase, Transition Phase, Preparation Phase, Competitive Phase & Transition Phase. The Preparation Phase (PP) is the longest phase and is for preparing the athletes base. Different cycles and specifics within the PP will vary depending on weakness which became evident from the previous years competition, illness or injury. The Competition Phase (CP) contains the main peak for the season. It will also contain some pre-peak competitive events for specific adaptions only available with racing and also it will contain some specific preparatory training session with some loading and unloading of specific fatigue. The Transition Phase (TP) is where the athlete allows his/her biological regeneration, psychological rest and relaxation to take place. This could last up to 5 weeks but the general norm would be 3 – 4 weeks. The above Phases are considered a Macrocycle. In general the Preparation Phase (PP) lasts for 65 – 75% of the Macrocycle. This is then broken down into Mesocycles and Microcycles. A Mesocycles would last from 2 to 6 weeks with a microcycle lasting a week. So in a month or 4 week Mesocycle we would have 4 Microcycles. Contained in the Mesocycle we would have 3 Microcycles containing specific work and 1 Microcycles containing recovery. The Microcycles is nearly always different from week to week depending on where it is in the Mesocycle and Macrocycle. The competition last 15 – 20% and contains preperation races and the main peak followed by a few post peak races as performance declines. The competition phase is back-ended by the transition phase which would generally be 10% in duration. If you spend some time at the kitchen table with next years calendar and the end of this years you will see benefits to your performance for 2013. This entry was posted in Reviews, Training and tagged Annual Plan, Cpmpetition Phase, Cycling Endurance exercise engineering Fatigue Profiling Heart Rate Monthly Testing Protocol Orthostatic Heart Rates Power sports and exercise engineering sports engineering Sports Exercise Engineerin, Endurance, Fatigue Profiling, Macrocycle, Mesocycle, Microcycle, Preparation Phase, principles of training, Sports Exercise Engineering, Training, Transition Phase, winter program. Bookmark the permalink.